Excitement is reaching ‘fever pitch’ as legendary local football fans anticipate Northern Ireland and The Republic of Ireland’s campaigns to earn their place in World Cup 2018. But as all loyal fans know, supporting their team does not begin and end with the match – no matter how thrilling the play. The build-up, the participation of watching the game and the celebration (or commiseration!) of the result with the team’s ‘family’ of supporters is an essential element of any match day. Now, for local fans, the whole World Cup experience is significantly enhanced by the announcement of the perfect Fanzone home for the Green and White Army in the vicinity of Windsor Park. Former Miss Northern Ireland Leanne McDowell and former Miss Ireland Sacha Livingstone kicked off celebrations as Norlin Ventues, together with SquarePit, today unveiled the exciting news they will be hosting Belfast’s largest indoor football Fanzone at South 13 (S13), the former B&Q site on The Boucher Road. 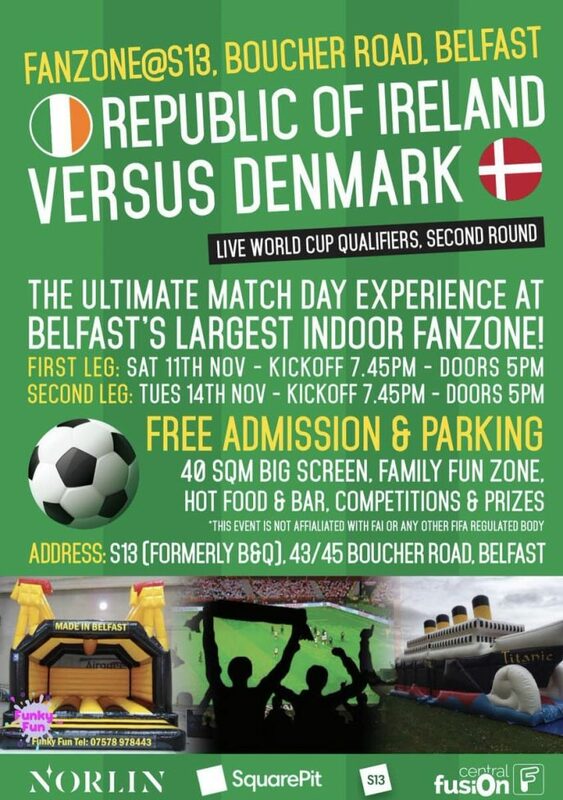 The venue is expected to be very popular with fans as its located conveniently close to Windsor Park, where the first qualifier match will take place on November 9. The new S13 Fanzone offers free entry and gives families the chance to enjoy supporting their team in a safe, convenient location with excellent parking and facilities. Fans can also wear their team’s football strip, unlike many venues in the province. 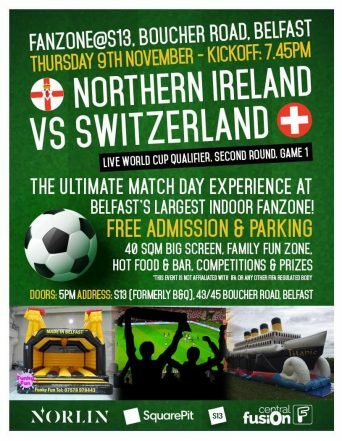 Gary Flynn from S13 says: “This is the biggest Fanzone in Belfast, complete with a 40 square meter screen, live music and a 10,000 people capacity, so the atmosphere is going to be electric. This event is free of charge to the public and has the added benefit of being a family-friendly complete with bouncy castles, face painting, penalty shoot-outs and chance to win fantastic prizes. So, the little ones will be entertained while parents can relax and cheer on their team. Everyone wins – unlike the outcome of the football matches which are set to keep the country’s nerves jangling during the qualifying stages. 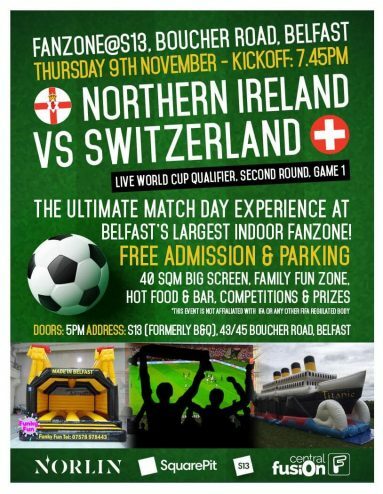 “Activities will be taking place before and after Northern Ireland’s first home game at Windsor Park, so even if you’ve been lucky to secure a ticket to the match, you can get into the party mood pre, or post-match. 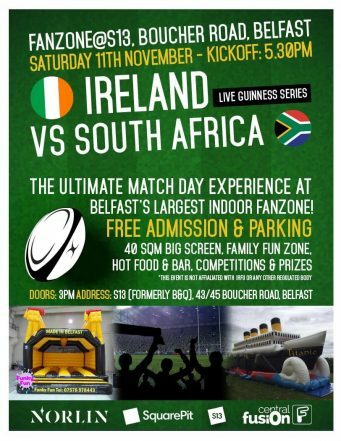 “It’s going to be a double header on 11th November as we’re also going to host the International rugby game for Ireland versus South Africa, so undoubtedly S13 is going to be the place to be for all football and rugby fans,” Gary Flynn from S13 said. 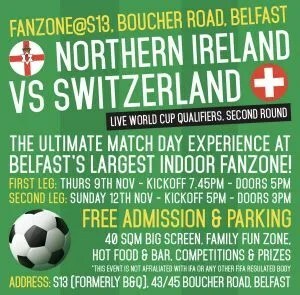 The Fanzone is the latest addition to an already packed schedule at the innovative South Belfast community hub. LOVE COMPETITIONS? – ENTER AND WIN GREAT PRIZES!!! !